LATEST UPDATE FOR THE 2015-16 HOLIDAY SEASON & BEYOND! SPREADING THE WORD ABOUT HELPING MARSHALL FIELD'S COME BACK MADE EASY! 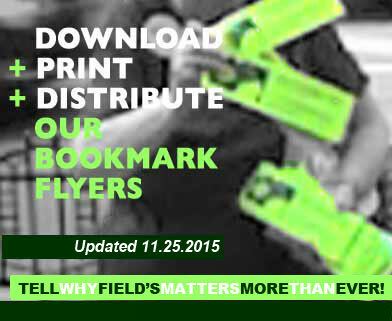 TO PRINT YOUR OWN BOOKMARK-STYLE LEAFLETS! Simply download , print and distribute to all! Be sure to check back for new and updated posters, leaflets, flyers and postcards as rallies, events and activities are added to our calendar. 2.75" x 8.5" bookmark-style leaflet as passed out on State Street & elsewhere. Updated for the 2015-16 Holiday Season & beyond. The 4-strips-per-page configuration can be a touch hard to explain to some copy shops. The following are printing instructions that understood by most copy shops such as FedEx Office aka "Kinkos" or others. You will note that the PDF consists of two identical pagesthis is intentional as the prints will be run front back. For best quality, give the copy shop the actual PDF file rather than copy a printed master version--the prints will be much sharper. Right-Click the link below and select "Save To Disk" to download our 2015-16 Leaflet. 2015-16 Bookmark Flyer/Leaflet: named "ffc11252015leaflet.pdf"
Special thanks to J., Jon, Doris, "gle", Mike, Alfred, Carol, Gail, Erick, Denise, Sharon, Siamak, so many others, and of course, "gle" who have helped make distribution of over 175,000 leaflets (and counting) possible. Special thanks to Mike for the idea of this campaign. This site is NOT affiliated in any way with Marshall Field's, Macy's, Macy's, Inc., Selfridges Group or these companies' subsidiaries. ©2006, 2007, 2008, 2009, 2010, 2011, 2012, 2013, 2014, 2015 All Rights Reserved.